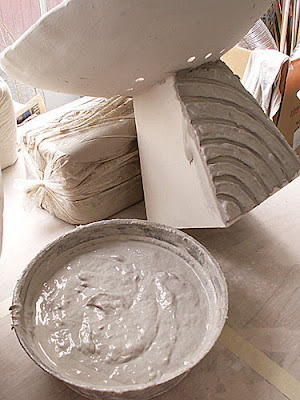 This Is one of the major advantages of paper clay over a traditional clay, being able to continuously work on a piece even though the base piece is bone dry, in this case, adding wet paper clay onto a bone dry paper clay base. I use this technique often in my sculptures. In this current project, I decided to add some texture to the pyramid base of my new succulent planter. I find the smooth sides too blah and in need of some interesting texture for the glaze to grab onto. The base was recycled from another project so I was happy to be able to use it with a bit of modification. I knew I wanted some thick heavy texutre so I lathered on a thick layer of paper clay slip the consistency of heavy oatmeal on each side, and then proceeded to gouge deep furrows in the still wet paper clay slip to get my design. This process was repeated for each of the four sides of the base. The piece was then set out to dry. Then it will be ready for bisque fire. No, I’m not talking about the Thanksgiving feast most of us have partaken in this year, nor am I talking about the extra pounds most of us will put on between now and the new year that will make many of us flock to a gym to make good on our New Year’s resolution to be in better physical shape for the new year. I’m refering to something we feel and use all the time as artists creating our works. It is a very experiential and personal feeling and may even defy explanation, but we all feel it, either consciously or subconsciously. I think as artists we rely on this internal feedback a lot more than we ever imagine. It is done continuously and intuitively as we create a piece of work and all the way through till the end of the project. We rely on our gut feelings and our individual esthetics to place the next blob of clay on our sculpture, to reposition or remove the clay until it looks and feels right to us. We do not go by text books or set formulae to direct our hands and eyes which work so naturallly and efficiently that to others it may look like magic what an accomplished aritist or scluptor can do. Sure, you learn the fundamentals and basics from your teacher, mentor, or from a course. That will only take you so far. After that, you are on your own. It’s you, your preferred medium, in my case, paper clay, your esthetics and your gut. So, take pride in that feeling that makes each of us unique, creating our own works of art to share with the world.